All over the forums I keep reading that the mega-systems at the show were nothing special. I sometimes wonder what people are expecting from these systems. I know it’s popular on the internet to talk about how overpriced these uber-expensive systems are. That may or may not be the case but to say they don’t sound good is a stretch. I thought all three Wilson Audio rooms sounded good, but it seemed to me they got better as the speakers got smaller. That’s really no surprise considering the rooms. There were several of these mega-systems that I thought sounded simply wonderful. I’ve already in my first show report talked about the one from High Water Sound, so I won’t talk about it again; but let me tell you about a few of them. 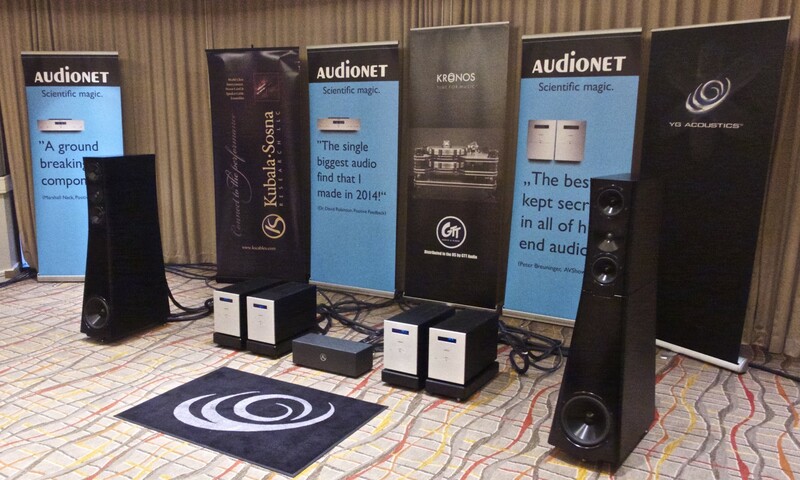 The YG Acoustics/Audionet/Kronos room was simply incredible. Show after show it seems YG Acoustic speakers sound better and better. Combined with Audionet amplification and the Kronos turntable for the source they sounded better than I had ever heard them before. I didn’t go to Chicago or Munich, so I don’t know how they sounded there, but at Newport, they played real music. This was the first opportunity I have had to really hear the Audionet. If you haven’t heard about Audionet, they are from Germany. 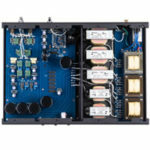 They make an all solid-state preamp, phono preamp and a pair of monoblock amps. 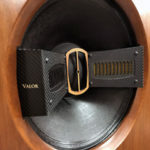 If how they sounded in this system is any indication, they are every bit as good as what I had been hearing about them. I couldn’t have told you if I was listening to great tube electronics or great solid state, but I knew that I was listening to great music. The sound was so transparent, so clear and it was if there was nothing between the listener and the music. In addition, as clear and transparent as the system sounded, it was not the least bit lean. It was full and had good tonal colors. Lastly, this system had something I had heard before and every time in a great sounding system. That would be the incredible Kronos turntable. As impressive as it is to see, it’s even more impressive to hear how systems sound with it spinning LPs. The system was connected with Kubala-Sosna cables. 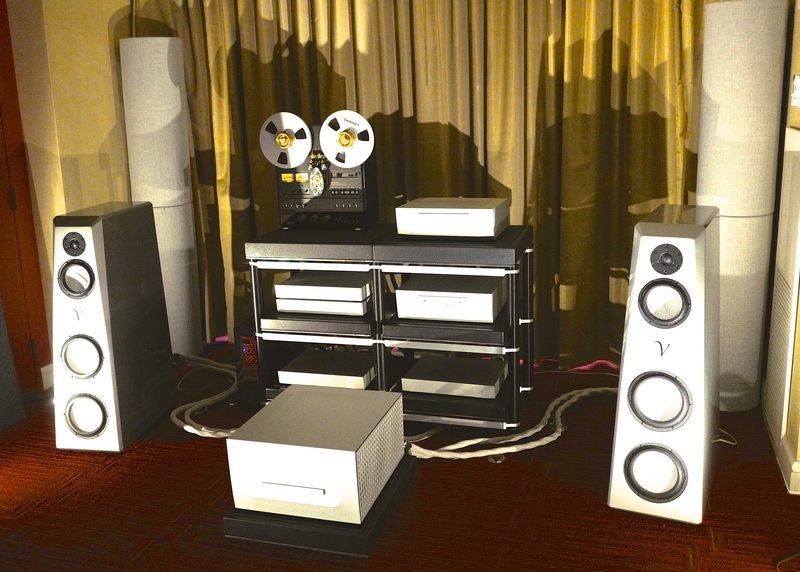 I promise you this was a mega system that sounded simply wonderful. The third mega-system that play music that really moved me emotionally was the Blue Light Audio room. They were playing the big, and I do mean big, Evolution Acoustics speakers driven by darTZeel electronics; and the source I listened to was the Wave Kinetics’ NVS turntable. I have often and again at this show marveled at the sound of their little MicroOne speakers. This year they were playing Quad DSD in Positive-Feedback’s room. As good as the MicroOnes are, they did not prepare me for the big guys. They have all the finesse of the little guys and then some. They produced a sound that was big and powerful as you would expect from a speaker this size, but they did not sound bigger than life. This room was one of the few at the show where the music really moved me. I have seldom found Von Schweikert speakers to be my cup of tea at audio shows. 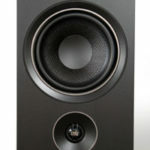 I do remember one time several years ago I thought they showed potential, but I have thought of them as good sounding, audiophile speakers, not speakers that produce an emotionally involving musical experience. At this show, Von Schweikert Audio teamed up with Constellation and Critical Mass Systems to produce a sound that really shocked me. The VR55 Active speakers sounded very involving when fed from the Technics SL-1500 open-reel tape machine in the room. This was a system that had to be considered one of the best at Newport. I don’t know how much of this was due to the pairing with the Constellation electronics and the source of great reel-to-reel tapes, but I was very pleasantly surprised. I have always admired the work of Adler’s Voxativ speakers. They are imported to the U.S. by Alfred Kainz of highend-electronics.com who drove up from Apple Valley, California. 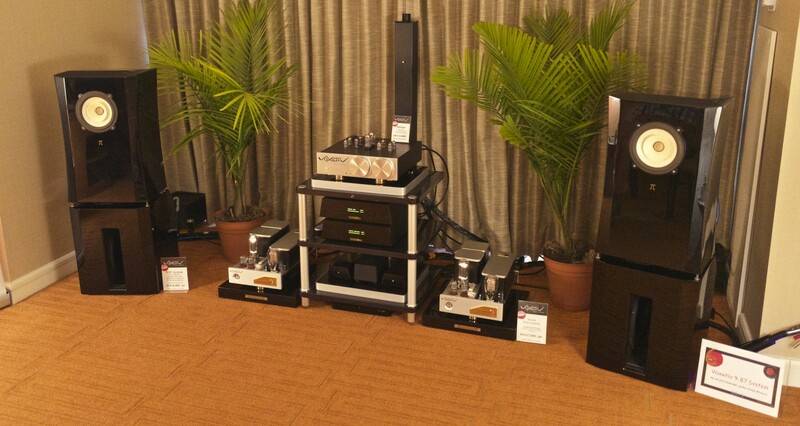 I had trouble getting the Ampeggio model to work in my room, but I would love to give the $34.9k Voxativ 9.87 a try or maybe even the top half which by itself is called the Voxativ Pi. 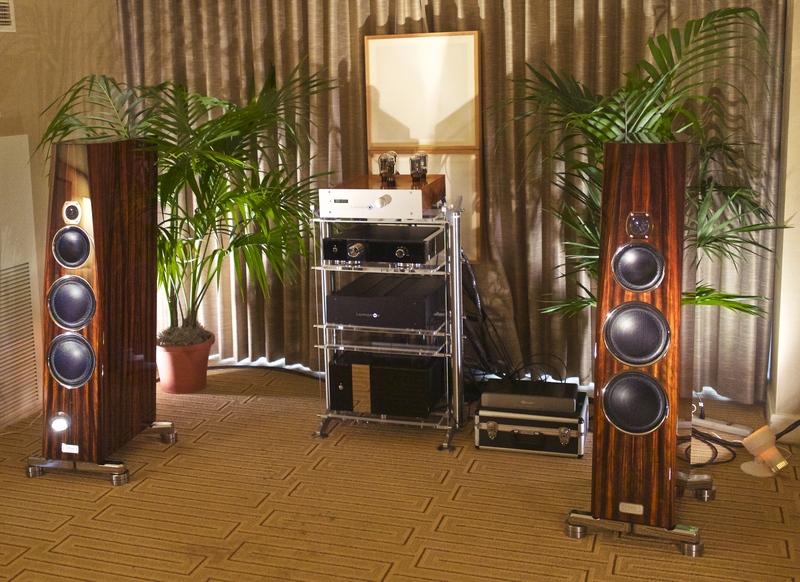 The 9.87s at the show were single-driver speakers that used Voxativ’s AC-4x spruce-wood-cone driver with neodymium magnet. The top unit used what Voxativ calls an Acoustic Stealth Technology sound guiding system. With the AST-Horn, the top half of the speaker could radiate about 40 Hz and sounded much more “open” than a reflex system. I totally agree it sounded much more open than the Ampeggio. The top unit which sat atop what they referred to as an active 12″ dipole bass “extender”. It was an active unit driven by a 250W class AB plate amp with an adjustable crossover. 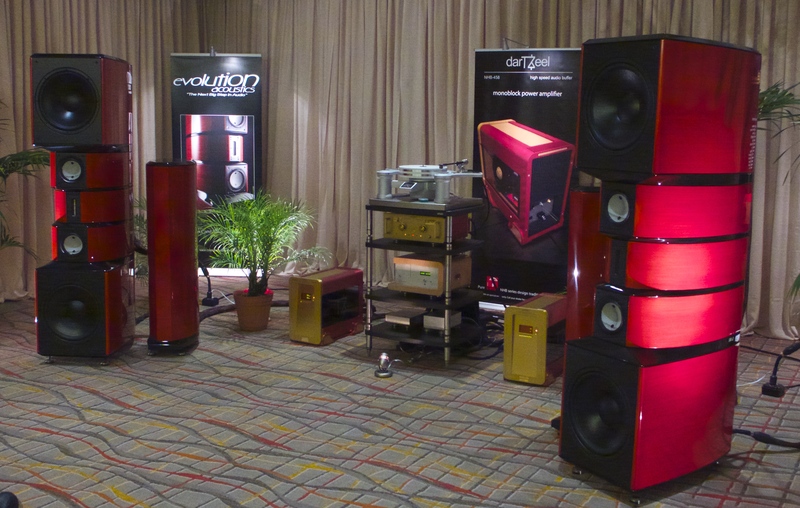 The electronics were the Voxativ 845 SET monoblock amps and Ampeggio preamp. The source was by Totaldac digital of Germany. The sound was as good or better than anything at the show at any price. 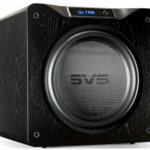 I love single-driver speakers and even with the bass extender, the sound was that of one of the best single-driver speakers I have ever heard. Again, let me say this was easily one of the very best sounds of the show. In price, it’s not quite a mega-system, but in sound it surely was! This room was far and away the best digital-only sounding room. 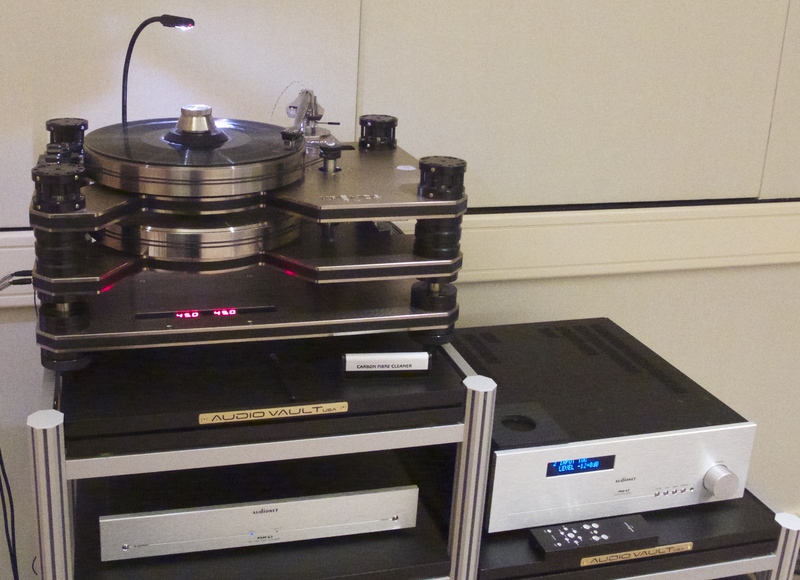 It featured a Lampizator Digital source and Tidal Contriva G2 three-way. It used a diamond tweeter, a ceramic cone midrange, and two ceramic cone woofers. Electronics were Tidal Preos-D preamplifier and Impulse Dual Mono amplifier. The sound was simply beautiful, and the speakers were very striking to look at as well. The room also featured Dynamic Design, the third partner, Heritage series cables. We are proud of our contribution to the excellent sound in the room. Arbitrarily omitting a partner in a shared room is patently unfair especially with the efforts made to make sure that all media members were handed the full list of participants in the room! Sorry, I wasn’t given any info in this room. I should have asked. Thanks for adding this info to the review. Totaldac is from France not Germany. Thanks, for the correction for some reason my notes said Germany. Thanks Jack, very gracious of you!